We describe a method to establish human enteroids from small intestinal crypts and colonoids from colon crypts collected from both surgical tissue and biopsies. In this methodological article, we present the culture modalities that are essential for the successful growth and maintenance of human enteroids and colonoids. Mahe, M. M., Sundaram, N., Watson, C. L., Shroyer, N. F., Helmrath, M. A. Establishment of Human Epithelial Enteroids and Colonoids from Whole Tissue and Biopsy. J. Vis. Exp. (97), e52483, doi:10.3791/52483 (2015). The epithelium of the gastrointestinal tract is constantly renewed as it turns over. This process is triggered by the proliferation of intestinal stem cells (ISCs) and progeny that progressively migrate and differentiate toward the tip of the villi. These processes, essential for gastrointestinal homeostasis, have been extensively studied using multiple approaches. Ex vivo technologies, especially primary cell cultures have proven to be promising for understanding intestinal epithelial functions. A long-term primary culture system for mouse intestinal crypts has been established to generate 3-dimensional epithelial organoids. These epithelial structures contain crypt- and villus-like domains reminiscent of normal gut epithelium. Commonly, termed “enteroids” when derived from small intestine and “colonoids” when derived from colon, they are different from organoids that also contain mesenchyme tissue. Additionally, these enteroids/colonoids continuously produce all cell types found normally within the intestinal epithelium. This in vitro organ-like culture system is rapidly becoming the new gold standard for investigation of intestinal stem cell biology and epithelial cell physiology. This technology has been recently transferred to the study of human gut. The establishment of human derived epithelial enteroids and colonoids from small intestine and colon has been possible through the utilization of specific culture media that allow their growth and maintenance over time. Here, we describe a method to establish a small intestinal and colon crypt-derived system from human whole tissue or biopsies. We emphasize the culture modalities that are essential for the successful growth and maintenance of human enteroids and colonoids. The lining epithelium of the gastrointestinal tract is in constant renewal. This process is triggered by proliferation of intestinal stem cells (ISCs) which continuously produce progeny to rapidly replace the intestinal epithelium as it turns over. The proliferative compartment comprising the ISCs is confined to the bottom of the crypts. The ISCs give rise to progeny which eventually differentiate into absorptive or secretory lineages. Moving out of the crypt and onto the villus or surface epithelium, cells differentiate progressively as they migrate upwards before exfoliation into the lumen1. ISCs give rise to all intestinal epithelial cell types including enterocytes, microfold cells, enteroendocrine cells, goblet cells, tuft cells and Paneth cells. The colon is characterized by elongated crypts composed mostly of colonocytes and goblet cells, with scattered enteroendocrine and tuft cells2. Ex vivo culture systems constitute promising tool for studying ISC maintenance and intestinal tissue homeostasis. However, it is difficult to rely on tissue culture technologies as physiological conditions are not fully reproduced and the epithelial microenvironment often altered3,4. A major advancement in ISC field was the establishment of tissue culture techniques to maintain and expand individual murine ISCs using defined growth factors to replace the normal intestinal niche signals. 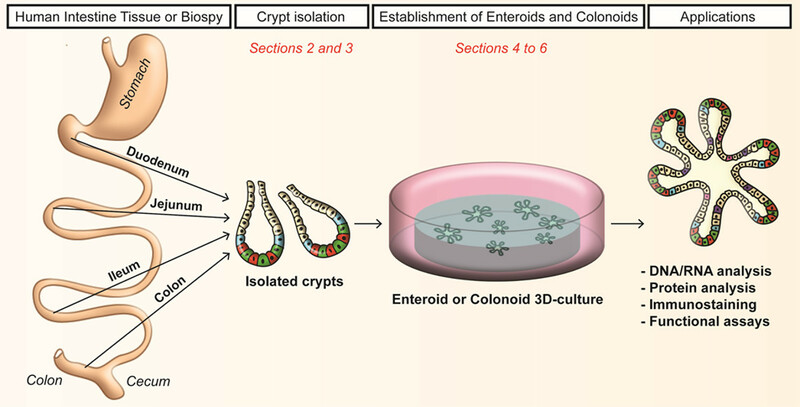 Long-term culture conditions were described by Sato et al., in which single crypts or isolated stem cells from the intestinal epithelium grow to form 3-dimensional epithelial structures including multiple crypt-like domains 5-7. These tridimensional structures undergo fission events to continuously expand. Interestingly, all the intestinal cell types specific to the tissue of origin are produced and as well are extruded into a lumen8. Using modifications of this system, epithelial organoids can be generated from the stomach, small intestine and colon. More specifically, epithelial organoids from the small intestine are enteroids9, and those from the colon are colonoids9,10. 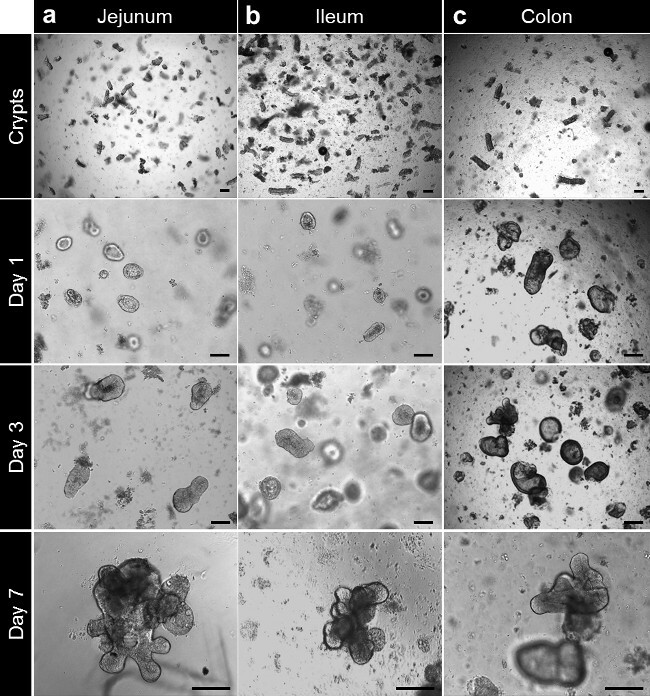 These epithelial organoid culture systems have been used to test the ability of isolated single cells to function as stem cells in vitro, thus testing the “stemness” of isolated cells5,6,10-15. Other investigators have used both enteroids and colonoids to study the function of individual epithelial cells16-21. Thus, enteroid and colonoid cultures can be used to evaluate both stem and non-stem cell functions and give new insight into fundamental cellular interactions within the intestines. 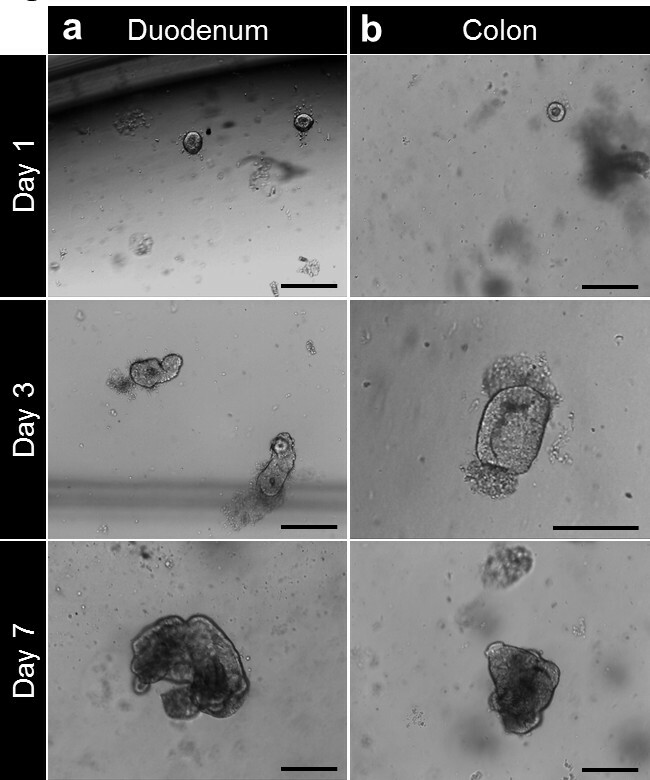 In 2011, Sato and colleagues generated long-term culture of epithelial organoids derived from human small intestine and colon22,23. Besides differences in media composition, the human epithelial enteroids and colonoids exhibit the same features as their murine counterpart. Furthermore, they can be generated from diseased tissues such as Barrett’s esophagus, adenoma or adenocarcinoma, and cystic fibrosis22,24. Human enteroids constitute a valuable system to study intestinal stem-cell and epithelial mucosal biology and serve as a novel experimental system to study both normal and abnormal gastrointestinal physiology3. Here we describe methods to establish enteroids and colonoids from human small intestine and colon crypts (Figure 1). In this methodological review, we emphasize the crypt collection from whole tissue and biopsies. We recapitulate the culture modalities that are essential for the successful growth and maintenance of human enteroids and colonoids and the possible experimental strategies carried out by this model. NOTE: Ethics Statement: All experimentation using human tissues described herein was approved by an IRB at CCHMC (IRB #2012-2858; #2014-0427). Informed consent for tissue collection, storage, and use of the samples was obtained from the donors at CCHMC. NOTE: All reagents are listed in Table 1. Prepare EDTA stock solution as follows: prepare 0.5 M ethylenediaminetetraacetic acid, pH 8 (EDTA) in ultrapure H2O, filter sterilized with 0.22 µm filter. Optionally, store the EDTA stock solution at RT indefinitely. Prepare chelating buffer as follows: mix 2% sorbitol, 1% sucrose, 1% bovine serum albumin fraction V (BSA) and 1x Gentamicin/Amphotericin solution in Dulbecco’s Phosphate buffered saline without Ca2+ and Mg2+ (DPBS), filter sterilized with 0.22 µm filter. Prepare the chelating buffer fresh. Prepare Wnt-3A-conditioned medium as follows: Wnt-3A-conditioned medium is made in house using the cell line L Wnt-3A according to the manufacturer’s instructions (ATCC, CRL-2647). Supplement the medium with 2 mM glutamine, 10 mM HEPES, 100 U/ml penicillin, 100 g/ml streptomycin, 1 N2 supplement, 1 B27 supplement, 1% BSA and filter sterilized with 0.22-µm filter. NOTE: Test every batch for Wnt activity using a TOPflash assay. Use a stable HEK293 TOPflash cell line (Hans Clevers lab) with a Renilla luciferase assay kit according to the manufacturer’s instructions. Normalize the TOPflash assay with 100 ng/ml human recombinant Wnt-3A. Confirm at least a 10 fold-change activity of the conditioned media compared to control. Divide fresh Wnt-3A-conditioned medium into 10 ml aliquots in 15 ml conical tubes and freeze at -20°C for up to 6 months. Store thawed aliquots up to 5 days at 4°C without loss of activity. Prepare human minigut medium as follows: Supplement Advanced DMEM/F12 medium with 2 mM glutamine, 10 mM HEPES, 100 U/mL penicillin, 100 g/mL streptomycin, 1 N2 supplement, 1 B27 supplement, 1% BSA and filter sterilized with 0.22 µm filter. NOTE: Divide fresh human minigut medium into 10 ml aliquots in 15 ml conical tubes and freeze at -20°C for up to 3 months. Store thawed aliquots up to 5 days at 4°C without loss of activity. Prepare complete human minigut medium as follows: Prepare fresh before crypt culture or medium change human minigut medium (see 1.4) supplemented with 50% Wnt-3A-conditioned medium (see 1.3), 1 µg/ml R-spondin 1 (1:1,000 dilution of 1 mg/ml stock), 100 ng/ml Noggin (1:1,000 dilution of 100 g/mL stock), 50 ng/mL EGF (1:10,000 dilution of 500 μg/mL stock), 500 nM A-83-01 (1:1,000 dilution of 500 M stock), 10 µM SB202190 (1:3,000 dilution of 30 mM stock), 10 nM [Leu]15-Gastrin 1 (1:10,000 dilution of 100 µM stock), 10 mM Nicotinamide (1:100 dilution of 1 M stock) and 1 mM N-Acetylcysteine (1:1,000 dilution of 1 M stock). NOTE: Store complete human minigut media up to 2 days at 4°C without loss of activity. NOTE: From the tissue collection, it is essential to maintain the sample in saline. It is recommended to keep the tissue on ice during transportation. Preparation of the sample for isolation of crypt should be performed as soon as possible. NOTE: All reagents are listed in Table 1, tools, equipment, and consumables are listed in Table 2. Prepare all the reagents before beginning the experiment. Thaw the basement membrane matrix on ice and pre-incubate a 24-well plate in a CO2 incubator at 37°C. NOTE: Alternatively make a thin layer of basement membrane matrix using 15 µl/well in the center of a 24-well plate and place it in a CO2 incubator at 37°C. This facultative step keeps the basement membrane matrix as a drop during polymerization. Wash the tissue with ice-cold Dulbecco’s Phosphate buffered saline without Ca2+ and Mg2+ (DPBS). Proceed until the content of DPBS is clear. Using 0.2 mm diameter minutien pins, secure the tissue on a silicone-coated glass Petri dish filled with ice-cold DPBS. Stretch and pin the tissue flat with the mucosal side facing up. Under a dissecting microscope, remove the overlying mucosa from the submucosa and connective tissue using micro-dissecting scissors and fine point curved forceps (Figure 2A, B). Stretch and pin the dissected mucosa flat on the silicone-coated glass Petri dish with mucosal side facing up. 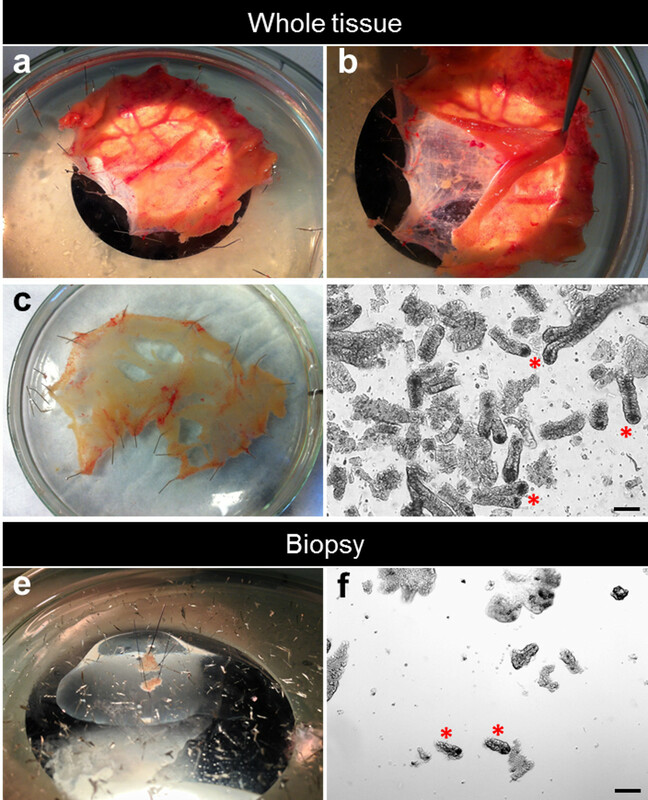 The remaining submucosa and connective tissue can be discarded or used for further experiments (Figure 2C). Gently scrape the surface of the mucosa with curved forceps. This step is necessary to improve the quality of the preparation. For small intestine, gently scrape the mucosa to remove the villi. For colon, gently scrape the mucosa to remove mucous and debris. Wash the mucosa 3-4 times with ice-cold chelation buffer to remove villi and debris. Cover the mucosa with freshly prepared 2mM EDTA chelation buffer (200 µl 0.5 M EDTA in 49.6 ml chelation buffer). Place the Petri dish on ice and shake gently for 30 min on a horizontal orbital shaker. Wash the tissue 3-4 times with ice-cold chelation buffer without EDTA. After washing, leave the mucosa in ice-cold chelation buffer. Process the mucosa under a dissecting microscope using curved and fine forceps. Gently scrape the mucosa to release intestinal crypts using the curved forceps. Gently remove the crypt suspension from the petri dish using a pipette and transfer it into a 50 ml conical tube. NOTE: check the tissue to make sure that almost all crypts have been removed from the mucosa. Filter the crypts suspension through a 150 µm mesh 2 times. NOTE: check the flow-through for crypt enrichment under a microscope (Figure 2D). Centrifuge the crypt suspension 5 min at 50 xg, 4°C. Discard the supernatant. Resuspend the pellet in 5 ml ice-cold chelation buffer. Count the number of crypts per 10-µl drop from the suspension from step 2.15. Transfer the number of crypts needed for plating to a 5 ml round-bottom tube. Use 200 to 500 crypts per well of a 24-well dish to establish enteroids or colonoids. Centrifuge the crypt fraction for 10 min at 150 g, 4°C. Remove the supernatant. Use crypts for subsequent culture. Prepare all the reagents before the beginning of the experiment. Thaw the basement membrane matrix on ice and pre-incubate a 24-well plate in a CO2 incubator at 37°C. Wash the biopsy with ice-cold Dulbecco’s Phosphate buffered saline without Ca2+ and Mg2+ (DPBS). Using 0.1 mm diameter minutien pins, secure the biopsy on a silicone-coated glass Petri dish filled with ice-cold DPBS. Stretch and pin the mucosa flat with the mucosal side facing up (Figure 2E). Gently scrape the surface of the mucosa with curved forceps to remove villi and debris. This step is necessary to improve the quality of the preparation. Wash the biopsy 3-4 times with ice-cold chelation buffer to remove villi and debris. Cover the biopsy with freshly prepared 2mM EDTA chelation buffer (200 µl 0.5 M EDTA in 49.8 ml chelation buffer). Wash the biopsy 3-4 times with ice-cold chelation buffer without EDTA. After washing, leave the biopsy in ice-cold chelation buffer. Process the biopsy under a dissecting microscope using curved and fine forceps. Gently scrape the mucosa to release the intestinal crypts using curved forceps. Gently remove the crypt suspension from the petri dish using a pipette and transfer it to a 50 ml conical tube. Filter the crypt suspension through a 150 µm nylon mesh 2 times. NOTE: check the flow-through for crypt enrichment under a microscope. Resuspend the pellet in 1 ml ice-cold chelation buffer. Transfer the crypt suspension to a 1.5 ml microfuge tube. Centrifuge the crypt fraction for 10 min at 150 x g, 4°C. Remove the supernatant. Using pre-chilled pipet tips, resuspend the crypt pellet (from step 2.18 or 3.15) in basement membrane matrix (200 to 500 crypts/50 µl basement membrane matrix). Apply 50 µl of crypt suspension in basement membrane matrix per well on the pre-warmed plate. Slowly eject the basement membrane matrix in the center of the well. Place the 24-well plate in a 37°C, 5% CO2 incubator for 30 min to allow a complete polymerization of the basement membrane matrix. Overlay the basement membrane matrix with 500 µl of complete human minigut medium supplemented with 2.5 µM CHIR99021 (1:4,000 dilution of 10 mM stock) and 2.5 µM Thiazovivin (1:4,000 dilution of 10 mM stock). Incubate the plate in a 37°C, 5% CO2 incubator. Replace the medium with fresh complete human minigut medium every 2 days. 5. Passaging of Cultured Enteroids and Colonoids. NOTE: Passage Enteroids and Colonoids every 7 to 10 days after initial plating. Generally, split one well into 3 to 4 wells. Remove the media using sterile tips and overlay with 1 ml of ice-cold DPBS. Pipette back and forth with a 1,000 µl tip. Transfer the solution in a new 15 ml conical tube. Add 2 ml of human minigut medium supplemented with 5% FBS per 1 ml of medium. Centrifuge the solution for 5 min at 50 x g, 4°C. Discard the supernatant. Resuspend the pellet with 2 ml of cell dissociation enzyme supplemented with 10 µM Y-27632 (1:1,000 dilution of 10 mM stock). Incubate for 5 min at 37°C in a water-bath. Dissociate the cell clumps using a 3 ml Luer-Lock syringe equipped with a 18-G fill/blunt needle. Gently pipette the solution back and forth using the syringe 10 times. Centrifuge the suspension for 5 min at 500 x g, 4°C. Discard the supernatant. Using pre-chilled pipet tips, resuspend the cell pellet in basement membrane matrix. Place the 24-well plate in a 37°C, 5% CO2 incubator for 20 min to allow a complete polymerization of the basement membrane matrix. Overlay the basement membrane matrix with 500 µl of complete human minigut medium supplemented with 10 µM Y-27632 (1:1,000 dilution of 10 mM stock). After 2 days, replace the medium with fresh complete human minigut medium supplemented with 10 µM Y-27632 (1:1,000 dilution of 10 mM stock). Thereafter, replace the medium with fresh, complete human minigut medium every other day. NOTE: Usually freeze one well into 2-3 cryovials. Repeat steps 5.1 to 5.8. Resuspend the pellet with cold freezing medium. Transfer 1 ml of freezing solution into a labeled cryovial. Place the cryovial in a freezing container containing 500 ml of isopropyl alcohol. Transfer the freezing container to a 80°C freezer for 24 h, then transfer cryovial to liquid nitrogen storage. NOTE: Store Enteroids and Colonoids for up to 1 year. Figure 2D shows a typical example of freshly isolated crypts from whole tissue (Figure 2D). The number of crypts isolated from a biopsy is lower than in whole tissue. Using standard capacity biopsy forceps with needle, we usually perform two biopsy bites on a single pass. Each biopsy bite results in a 10 mm2 surface with an average of 50 to 100 crypts per biopsy (Figure 2F). After culture in basement membrane matrix, the crypts round up to form enterospheres for small intestine and colonospheres for colon. The crypt budding usually occurs within 5 to 6 days, after seeding. However it is not unusual to see either enteroids (enteroids) or colonoids (colonoids) forming spheres in the basement membrane matrix (Figure 3A-C; Movie 1). The passaging can be done after 7 days, depending on the size of the enteroids. The enteroids or colonoids established from biopsies undergo the same development in culture. However, as the crypt density at seeding is lower, the passaging is usually done after 10 to 12 days in culture (Figure 4a,b). Enteroids and colonoids cultures expand in a reproducible manner. Both enteroids and colonoids present a luminal side and are lined with an epithelium (Figure 5A, B). Proliferative cells can be observed within the enteroids and are located within the bud tips (Figure 5C, D). Confocal imaging of enteroids stained with E-cadherin (Ecad) shows the epithelial cells (Figure 5E). Both enteroids and colonoids can be established from tissue obtained from patients with genetic/congenital disorders. Figure 6 shows representative enteroids growing from a patient with cystic fibrosis (Figure 6A) and a tufting enteropathy due to a congenital mutation in the epithelial cell adhesion molecule gene (EpCAM) (Figure 6B). Beside the genetic defect, the enteroids do not exhibit differences in basal condition. Figure 1. Workflow of crypts dissociation and generation of human enteroids and colonoids in culture. Crypts (from human small intestine or colon) are isolated by EDTA chelation. Cultured crypts form enteroids for the small intestine and colonoids for the colon. Please click here to view a larger version of this figure. Figure 2. Dissection process for the crypt isolation. (A) The small intestine specimen is stretched and pinned flat into a silicone-coated Petri dish. (B) The mucosa is separated from the underlying submucosa. (C) The dissected mucosa is stretched and pinned flat into a silicone-coated Petri dish. (D) After EDTA chelation, the crypts are isolated from the tissue. 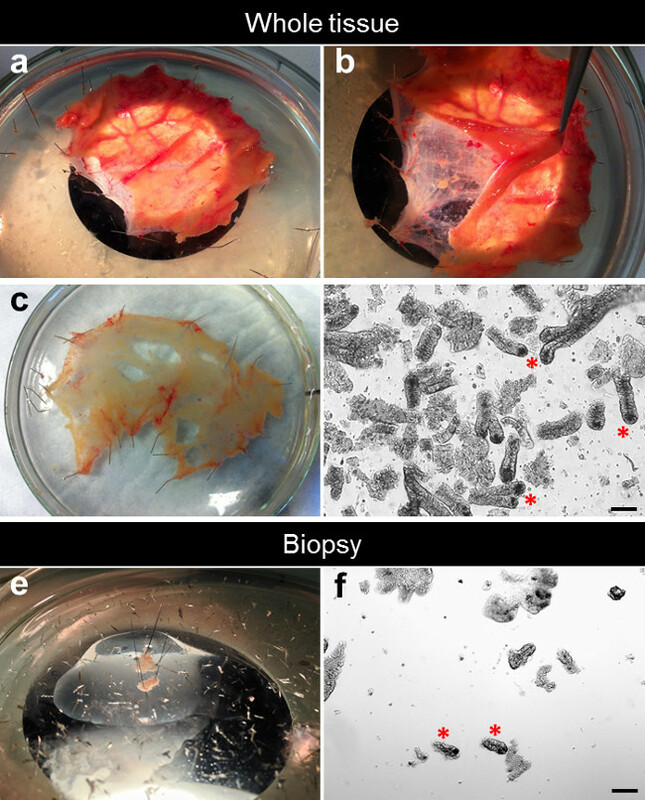 (E) One biopsy is stretched and pinned flat into a silicone-coated Petri dish. (F) After EDTA chelation, crypts are isolated from the biopsy. Please click here to view a larger version of this figure. Figure 3. Crypt culture and human enteroid and colonoid generation from whole tissue. (A) Jejunal crypts plated in basement membrane matrix after isolation. The crypts are closing up after 3 to 4 hr and start to balloon up to form enterospheres beyond this time. At 7 days, the jejunal enteroids are formed. (B) After isolation and culture, ileal crypts behave like the jejunal crypts and form ileal enteroids. (C) Colonic crypts are plated in basement membrane matrix after isolation. The crypts close and form colonoids after 7 days (Scale bars: 100 µm). Please click here to view a larger version of this figure. Figure 4. Crypt culture and human enteroid and colonoid generation from biopsy. (A) Duodenal crypts plated in basement membrane matrix after isolation. The crypts are closing up after 3 to 4 hr and start to balloon up beyond this time to form enterospheres. At 7 days, the enteroids are formed. (B) After isolation and culture, colonic crypts are plated in basement membrane matrix. The crypts close up to form colonospheres then colonoids after 7 days (Scale bars: 100 µm). Please click here to view a larger version of this figure. Figure 5. Intestinal lineages of the human enteroids. (A) Human enteroid after 6 days in culture. (B) Hematoxylin-eosin sections of the enteroids in (A) demonstrate the epithelial lining (Scale bars: 100 µm). (C-D) Confocal imaging of enteroids after EdU staining (magenta) shows the presence of proliferative cells. (E) Confocal imaging of enteroids demonstrates the presence of: E-cadherin for epithelial cells (ECAD, green) (Scale bar: 50 µm). Please click here to view a larger version of this figure. Figure 6. Crypt culture and human enteroid generation from diseased tissue. (A) Enteroids established from a cystic fibrosis specimen. (B) Enteroids established from a congenital tufting enteropathy specimen (Scale bars: 100 µm). Please click here to view a larger version of this figure. Movie 1. Enterosphere forming human enteroid in culture. 32 hr time-lapse movie shows an enterosphere established from human small intestine retracting to form an enteroid in culture. Please click here to view this video. Table 2. Detailed consumables, tools, and equipment needed for the crypt isolation and culture. This method provides a complete system reproducing intestinal epithelial lineages and epithelial dynamics which constitute a useful tool to study intestinal epithelial biology. The method presented herein was adapted from the original murine study by Sato and Clevers22 that efficiently results in human enteroids and colonoids. Here, we manually picked up the crypts by microdissection to avoid any cellular contaminants. This method allows a direct visualization of the crypts and leads to consistency overtime compared to the original crypt collection by “shaking”. Other groups developed similar technics using slightly different approaches especially replacing the chelation by EDTA with collagenase25. Besides the differences in crypt collection, those technics use a defined media that is required to grow the human enteroids in culture22. To increase growth efficiency at crypt seeding, we add a GSK3 inhibitor (CHIR99021) for the first two days 12. The handling of the tissue or biopsies is important and the crypt isolation should be performed as soon as the tissue arrives in the lab. However, delayed crypt isolation and culture could be performed up to 24 hr after tissue collection (data not shown) as previously described for murine tissue26. The intestinal tissue should be placed in a conical tube completely filled with DPBS to avoid tissue disruption and should be maintained at 4°C. The delayed preparation allows for tissue shipping but temperature variation should be avoided during transport. The overall time needed for the initial crypt plating is approximately 2 hr with 15 to 30 min to process the tissue and 1 to 2 hr to isolate and plate the crypt. The microdissection of the tissue is a critical determinant and predicate of a clean crypt preparation. However, the crypt release by hand-shaking as described in various protocols is possible22,23. Despite the similarities with the murine enteroid (enteroids) system, the human enteroids require specific molecules to enhance and sustain their growth over time. The growth factors, Egf, Noggin, R-spondin are used similarly to the murine epithelial organoids. However, the use of Wnt-3A is critical. We noted that the formation as well as the growth efficiency is greater using a Wnt-3A conditioned medium than the human recombinant protein. Concomitantly, we demonstrated improved culture conditions using an inhibitor of the glycogen synthase kinase 3 (CHIR99021)12. Recombinant growth factors could be replaced by Wnt-3A, R-spondin, and Noggin conditioned-media. A Wnt-3A-expressing L-cell line is commercially available (ATCC). Other groups have developed R-spondin 1–23,27, Noggin-19 , and Wnt-3A/R-spondin3/Noggin–28 expressing cell lines. Two small molecule inhibitors are used in the culture media and are necessary for the maintenance of the culture29. A-83-01 is a selective inhibitor of transforming growth factor β and Activin/Nodal receptors (activin-like kinase 4, 5, 7) and SB202190 is a p38 mitogen-activated protein kinase inhibitor (MAPK). Both inhibitors have been used respectively to sustain human induced pluripotent stem cells self-renewal and to establish human naïve pluripotent stem cells30-32. Also, nicotinamide, a precursor of nicotinamide adenine dinucleotide, is required to maintain enteroids and colonoids expansion in a long-term manner22,29. The EDTA chelation is an important step as it determines the yield from the crypt preparation. We have been successful with 2 mM EDTA treatment. However, EDTA concentration can be modified from 2 mM to 15 mM regarding the type of tissue. In that case, time of incubation has to be empirically determined. After the initial plating, the crypt will round-up and eventually form enteroids. However, the enteroids or colonoids often demonstrate a “stem” phenotype by forming spheres with little to no differentiated cells. In that case, differentiation can be initiated by withdrawing Wnt-3A, nicotinamide and the p38 MAPK inhibitor. The use of Notch inhibitor such as DAPT or DBZ helps enhancing the differentiation within the enteroids22. This model recapitulates the intestinal physiology with continual crypt-budding events arising from a stem cell compartment as well as villus-like epithelial domains containing both absorptive and secretory differentiated lineages. Interestingly, this system does not contain any mesenchymal cells and uses specific media conditions to meet the niche signal requirements. Like the murine model, human enteroids can be generated from isolated intestinal epithelial cells to test the capacity of those cells to function as a stem cell. Several studies have used cluster of differentiation markers (CD44, CD24 or CD166) and EPHB2 positive cells to enrich for cells with stem properties12,23,33. Together, these studies demonstrate the utility of human enteroids cultures for testing the stemness. Other investigators are using this model to investigate intestinal diseases such as infectious diarrheal diseases, cystic fibrosis, or colorectal cancers 22,34-37. These studies demonstrate that human enteroids constitute a reliable human disease model with a possibility to move towards a personalized screening. Human enteroids can be genetically modified using DNA transfection or infection with viral particles38. This provides a powerful tool to study gene-specific functions within the human epithelial organoids or correct genetic mutations. Recently, Schwank and colleagues demonstrated the possibility to edit the genome with the CRISPR/Cas9 system and correct the mutation on the CFTR gene causing a cystic fibrosis24. Human enteroids constitute a valuable system to study intestinal stem-cell and epithelial mucosal biology and serve as a novel experimental system to study both normal and abnormal gastrointestinal physiology. We gratefully acknowledge Dr. Hans Clevers (Hubrecht Institute for Developmental Biology and Stem Cell Research, Netherlands) for the kind gift of TOPflash cells. This project was supported in part by NIH-R01DK083325 (MAH); NIH P30 DK078392 (Digestive Health Center); NIH UL1RR026314 (CTSA). Noah, T. K., Donahue, B., Shroyer, N. F. Intestinal development and differentiation. Exp Cell Res. 317, (19), 2702-2710 (2011). Shroyer, N. F., Kocoshis, S. Pediatric Gastrointestinal and Liver Diseases. Hyams, J. R. W. III Elsevier. 324-336 (2010). Leushacke, M., Barker, N. Ex vivo culture of the intestinal epithelium: strategies and applications. Gut. (2014). Simon-Assmann, P., Turck, N., Sidhoum-Jenny, M., Gradwohl, G., Kedinger, M. In vitro models of intestinal epithelial cell differentiation. Cell Biol Toxicol. 23, (4), 241-256 (2007). Barker, N., et al. Lgr5(+ve) stem cells drive self-renewal in the stomach and build long-lived gastric units in vitro. Cell Stem Cell. 6, (1), 25-36 (2010). Mahe, M. M., et al. Establishment of Gastrointestinal Epithelial Organoids. Current Protocols in Mouse Biology. 3, 217-240 (2013). Sato, T., Clevers, H. Growing self-organizing mini-guts from a single intestinal stem cell: mechanism and applications. Science. 340, (6137), 1190-1194 (2013). Stelzner, M., et al. A nomenclature for intestinal in vitro cultures. Am J Physiol Gastrointest Liver Physiol. 302, (12), G1359-G1363 (2012). Ramalingam, S., Daughtridge, G. W., Johnston, M. J., Gracz, A. D., Magness, S. T. Distinct levels of Sox9 expression mark colon epithelial stem cells that form colonoids in culture. Am J Physiol Gastrointest Liver Physiol. 302, (1), G10-G20 (2012). Furstenberg, R. J., et al. Sorting mouse jejunal epithelial cells with CD24 yields a population with characteristics of intestinal stem cells. Am J Physiol Gastrointest Liver Physiol. 300, (3), G409-G417 (2011). Wang, F., et al. Isolation and Characterization of Intestinal Stem Cells Based on Surface Marker Combinations and Colony-Formation Assay. Gastroenterology. (2013). Yan, K. S., et al. The intestinal stem cell markers Bmi1 and Lgr5 identify two functionally distinct populations. Proc Natl Acad Sci U S A. 109, (2), 466-471 (2012). Es, J. H., et al. Dll1+ secretory progenitor cells revert to stem cells upon crypt damage. Nat Cell Biol. 14, (10), 1099-1104 (2012). Yui, S., et al. Functional engraftment of colon epithelium expanded in vitro from a single adult Lgr5(+) stem cell. Nat Med. 18, (4), 618-623 (2012). Durand, A., et al. Functional intestinal stem cells after Paneth cell ablation induced by the loss of transcription factor Math1 (Atoh1). Proc Natl Acad Sci U S A. 109, (23), 8965-8970 (2012). Sato, T., et al. Paneth cells constitute the niche for Lgr5 stem cells in intestinal crypts. Nature. 469, (7330), 415-418 (2011). Akcora, D., et al. The CSF-1 receptor fashions the intestinal stem cell niche. Stem Cell Res. 10, (2), 203-212 (2013). Farin, H. F., Van Es, J. H., Clevers, H. Redundant sources of Wnt regulate intestinal stem cells and promote formation of Paneth cells. Gastroenterology. 143, (6), 1518-1529 (2012). Rothenberg, M. E., et al. Identification of a cKit(+) colonic crypt base secretory cell that supports Lgr5(+) stem cells in mice. Gastroenterology. 142, (5), 1195-1205 (2012). Lau, W., et al. Peyer's patch M cells derived from Lgr5(+) stem cells require SpiB and are induced by RankL in cultured 'miniguts. Mol Cell Biol. 32, (18), 3639-3647 (2012). Sato, T., et al. 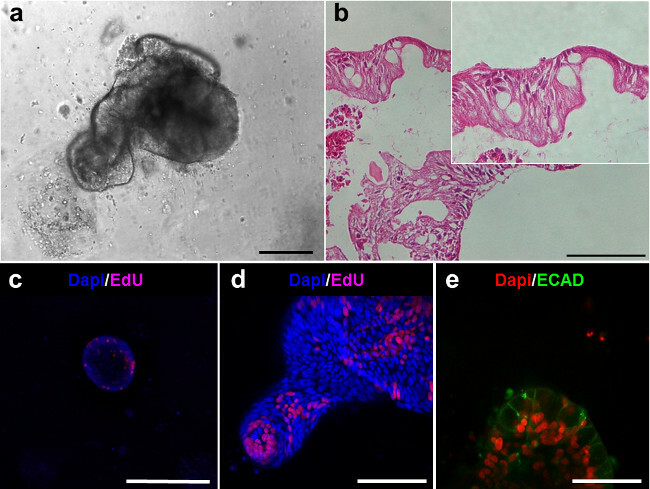 Long-term expansion of epithelial organoids from human colon, adenoma, adenocarcinoma, and Barrett's epithelium. Gastroenterology. 141, (5), 1762-1772 (2011). Jung, P., et al. Isolation and in vitro expansion of human colonic stem cells. Nat Med. 17, (10), 1225-1227 (2011). Schwank, G., et al. Functional repair of CFTR by CRISPR/Cas9 in intestinal stem cell organoids of cystic fibrosis patients. Cell Stem Cell. 13, (6), 653-658 (2013). VanDussen, K. L., et al. Development of an enhanced human gastrointestinal epithelial culture system to facilitate patient-based assays. Gut. (2014). Fuller, M. K., et al. Intestinal stem cells remain viable after prolonged tissue storage. Cell Tissue Res. 354, (2), 441-450 (2013). Ootani, A., et al. Sustained in vitro intestinal epithelial culture within a Wnt-dependent stem cell niche. Nat Med. 15, (6), 701-706 (2009). Miyoshi, H., Ajima, R., Luo, C. T., Yamaguchi, T. P., Stappenbeck, T. S. Wnt5a potentiates TGF-beta signaling to promote colonic crypt regeneration after tissue injury. Science. 338, (6103), 108-113 (2012). Koo, B. K., Clevers, H. Stem Cells Marked by the R-Spondin Receptor Lgr5. Gastroenterology. (2014). Li, W., et al. Generation of rat and human induced pluripotent stem cells by combining genetic reprogramming and chemical inhibitors. Cell Stem Cell. 4, (1), 16-19 (2009). Tojo, M., et al. The ALK-5 inhibitor A-83-01 inhibits Smad signaling and epithelial-to-mesenchymal transition by transforming growth factor-beta. Cancer Sci. 96, (11), 791-800 (2005). Gafni, O., et al. Derivation of novel human ground state naive pluripotent stem cells. Nature. 504, (7479), 282-286 (2013). Gracz, A. D., et al. Brief report: CD24 and CD44 mark human intestinal epithelial cell populations with characteristics of active and facultative stem cells. Stem Cells. 31, (9), 2024-2030 (2013). Foulke-Abel, J., et al. Human enteroids as an ex-vivo model of host-pathogen interactions in the gastrointestinal tract. Exp Biol Med (Maywood). (2014). Dekkers, J. F., et al. 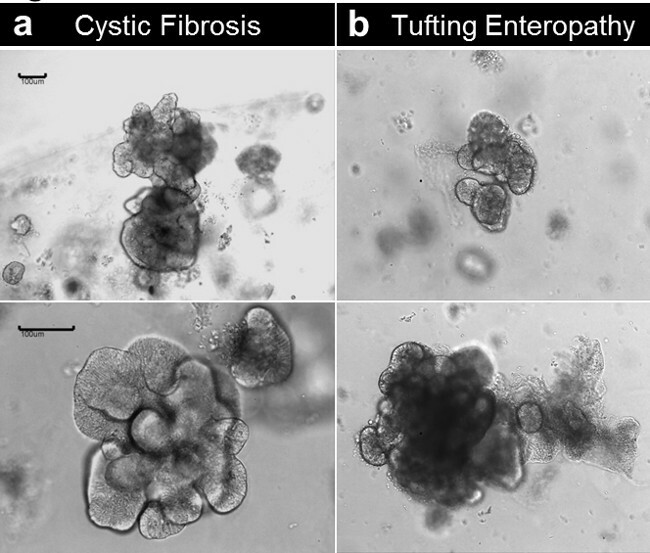 A functional CFTR assay using primary cystic fibrosis intestinal organoids. Nat Med. 19, (7), 939-945 (2013). Kovbasnjuk, O., et al. Human enteroids: preclinical models of non-inflammatory diarrhea. Stem Cell Res Ther. 4, Suppl 1. S3 (2013). Fujii, M., Sato, T. Culturing intestinal stem cells: applications for colorectal cancer research. Front Genet. 5, 169 (2014). Koo, B. K., Sasselli, V., Clevers, H. Retroviral gene expression control in primary organoid cultures. Curr Protoc Stem Cell Biol. 27, (Unit 5A), 6 (2013).